Cough is one of the common health problems that is faced by the people among all the ages in today’s world. The main reason for cough problems is mostly found in people who are affected by cold and fever. At times, pollution and smoke may be the reason for cough. However cough sometimes are also called as the dry cough. These give a feeling or irritation in the air passage path on the throat. But there are some effective remedies which may totally eradicate this syndrome completely. 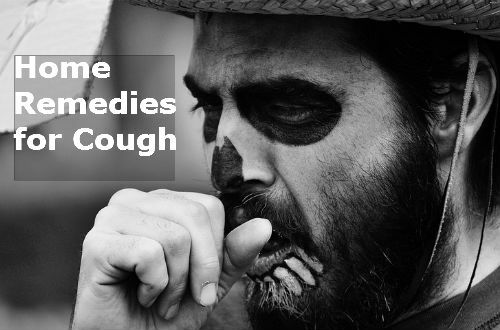 In this article, we will discuss about the home remedies for cough, which are purely based on the suggestions and recommendations of true evidences. Coughing is one infection among the people which may be the cause of any one of the following reasons. It may the cause of a viral infection or flu or the cold which usually spreads based on the season. At times, Smoking may be the reason for the cough problem. Several health problems such as tuberculosis and asthma also shows early symptoms of disease through cough. Turmeric is not only an antiseptic but can also be used as a medicine either solely or combined with other products to cure many defects in the human immune system. Turmeric also has several antibacterial properties and antiviral properties which helps in destroying the infections in the throat and relieves the person from cough. This may be added with water and pepper and allowed to boil with water for few minutes and consumed in lukewarm heat. This may also be mixed with a spoon of honey which will have immediate effect for dry cough. Ginger can also be used as an effective medicine for curing the cough problem. The preparatory method is to chop down the ginger into pieces and make sure that they are boiled with water in a vessel. After that, the boiled water is to be consumed for considerable number of times on a day to get relieved from cough. Also, you can directly chew the small pieces of ginger to make sure that your cough gets suppressed. Instead of adding water, choices of lemon juice and honey can be added to ginger for better taste among toddlers and young people. Lemon is a great antioxidant to the body and provides the energy to revitalize the body and perform the metabolic activities in the body at a good rate. In similar way, the Lemon can also be used for problems related to cough. The main reason for stating lime as one of the reason for curing cough is that it has the capabilities of anti-inflammation. The medicinal drink can be prepared by mixing the lemon juice to a spoon of honey and consumed two or three times a day to get relieved of cough problems. Garlic has good capabilities of fighting against the microorganisms and the infections that are caused by them. It is said to have both antimicrobial and antibacterial properties by nature. Take some cloves of garlic and boil it with water and then add some quantities of oregano. The mixture will not only help in relieving you from the cough problems but also relieves you from bad breath. Crushing the garlic and adding it to the food recipes you consume will also help in digestion problems. Adding a spoon of honey to the hot milk and consumption of the mixture will not only show effects on reducing the cough but will also prove to be a remedy for the mild chest pain which was caused due to the continuous coughing. To experience better results of this remedy, it is advisable to drink it before you go to sleep at night. To acquire extra benefits of revitalizing the fluids in the body, drink a spoon of honey early morning in empty stomach to get more benefits. Carrots as a vegetable contains variety of nutrients in it and also they compose of huge portions of vitamins and minerals. The preparation of the mixture is to take some fresh carrots as a whole and blend it well. Add some water as per requirement for diluting the solution. Now add a teaspoon of honey and consume it after your every meal in a day until you get fully relieved from the cough problems. This can be used as one among the major home remedies for problems related to cough. Almonds can also be used as an effective home remedy to cure the symptoms of cough and other problems related to cough. The procedure is to allow some almonds get immersed in water for nearly half a day and make a paste out of the soaked almonds. Now you add some butter for the betterment in taste and consuming it thrice a day will provide better results. Grapes can also be used as one among the major remedies for curing the cough problems. The grapes which are dry in nature can be mixed with a spoon of honey and consumed regularly as it eradicates the cough problems and also they provide some natural sources of stamina to the body. These are some of the home remedies which can be used to cure cough problems on your own at home. The reason for people searching home remedies for each and every infection is to avoid the side effects and other problems which may occur due to the use of pills and syrups from the medical stores. If the coughing problems persists for a longer period of time, it is advisable to consult your physician to check for the presence of any other infections which may have infected us.